Whether sunk on purpose, as an artificial reef or the result of mishap, wrecks open fascinating windows to the past. 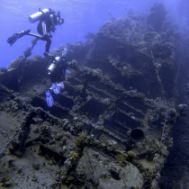 How to research and learn the background of your favourite wrecks. Be certified as a PADI Adventure Diver or have a qualifying certification from another training organisation. Be at least 15 years old. Four dives are required, If you have completed the Wreck dive as part of the Adventures in Diving program that dive may count as the first dive of this course.